My name is Melissa Fraser and this is my 1st year as President, I have been on the committee and a coach for the past six years. I was also a Woodville Little Athlete and competed from u6 all the way through to u16. The mission of the South Australian Little Athletics Association as a voluntary community based organisation, is to develop children of all abilities by promoting positive attitudes and a healthy lifestyle through a family and community involvement in athletic activities. The success of our Centre comes from parent support at our meetings and their willingness to attend at meetings away from this Centre. I would like to congratulate and thank all the parents and caregivers who support the club through chaperoning, time keeping, starting, and assisting at the BBQ and canteen. I would also ask that you consider joining the committee. We currently only have 7 committee members and would welcome a few more. This season will see many changes to the program with SALAA putting on a number of events at the Athletics SA Stadium (formally Santos Stadium). This will give all of our athletes from Tiny Tots to under 17 a chance to go out and compete on the rubber track and hopefully achieve a few Personal Bests. We will again be running the Pam Sard Memorial Trophy which will be a meeting with Henley Districts and West Lakes. The location of the meet will be rotated between the three centres. This season it will be at West Lakes, date is yet to be finalised. I will be out every Wednesday evening from 5pm-6pm for training which is based on event specific training this enable your children to learn the correct way to compete and give them every opportunity to improve their skills and their personal bests. This training is included in your registration fees, so bring them out and watch them improve as the season progresses. Last season we had 200 registered athletes which is great and it would be great to have another bumper year so spread the word and tell your friends. Remember Little Athletics lays the foundation for most other sporting activities. 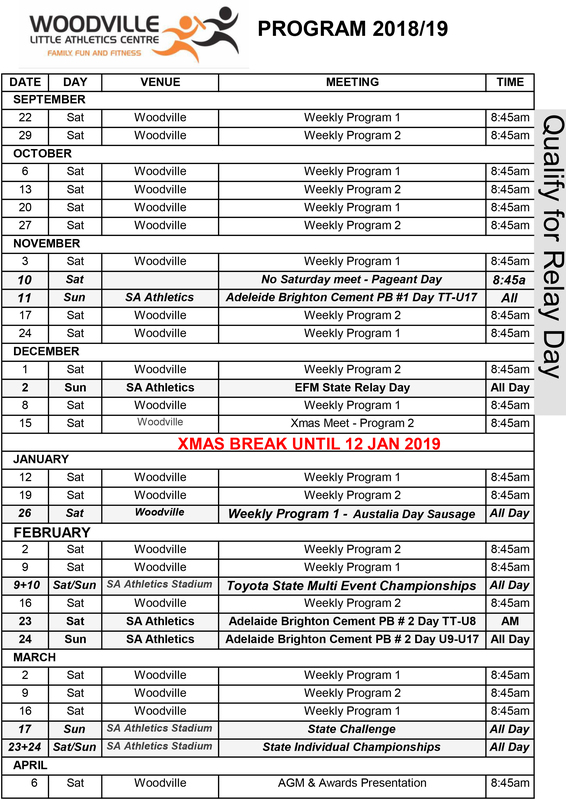 I would encourage you all to regularly check our website www.woodvillelittleathletics.com.au for updates and information. This has historical information, tips and will be updated with weekly information and reminders. I hope that both athletes and their parents/caregivers enjoy their time with Woodville Little Athletics Centre.